If you have roughly roughly 45 minutes to spend in the kitchen, Mexi-Chicken Roll Ups might be an outstanding gluten free recipe to try. One portion of this dish contains about 55g of protein, 24g of fat, and a total of 528 calories. This recipe serves 6. For $2.94 per serving, this recipe covers 33% of your daily requirements of vitamins and minerals. This recipe from Foodista has 4 fans. Head to the store and pick up pepper jack cheese, spinach, garlic powder, and a few other things to make it today. It works well as a hor d'oeuvre. Overall, this recipe earns a super spoonacular score of 80%. Similar recipes include Chicken roll-ups, Chicken Roll-ups, and Chicken Roll-em Ups for Two. Sparkling rosé and Sparkling Wine are my top picks for Roll Ups. If you're serving a selection of appetizers, you can't go wrong with these. Both are very food friendly and complement a variety of flavors. One wine you could try is Bellissima Sparkling rosé. It has 4.5 out of 5 stars and a bottle costs about 24 dollars. This is an elegant, bright rosé, with hints of strawberry and grapefruit, and a soft, persistent foam. Uncorked at the very last minute, Bellissima Sparkling Rosé pairs perfectly with smoked salmon, shellfish, and seafood hor d’oeuvres such as tuna tartare, sushi, and sashimi. Flatten out the chicken breasts to about 1/4" thickness. Blend together the cream cheese, salsa, cilantro, cumin and garlic powder to form a sauce. Spread spoonful of sauce across each breast. 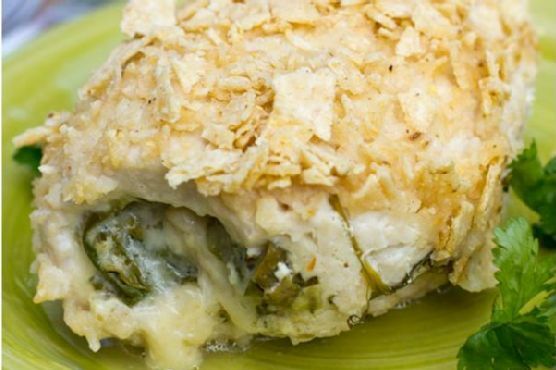 Top with spinach leaves and then cheese. Roll closed and cover in crushed tortilla chips. Bake at 350 covered for 30 to 35 minutes or until chicken is cooked through. If you need to soften a block of cream cheese before using it, you can unwrap it and heat it in the microwave on high for 10-15 seconds at a time until it is soft enough.